Due to the events of the past week, I've been feeling very patriotic, and wanted to read something distinctly... American. 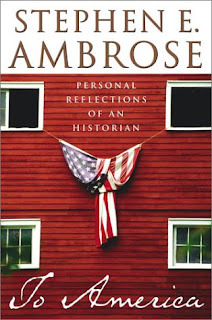 I found historian Stephen Ambrose's last publication "To America - Personal Reflections of an Historian" to be just such a book. Written right before he died in 2002, this short synopsis is a look back over event's and guiding principles he thinks have been key to the success of our country. A history teacher's final lecture on everything from Jefferson, Grant, and Nixon to racism and women's rights. But, Stephen Ambrose was mainly attracted to military history. According to him, "the key events in American history were military. Winning the Revolutionary War or the Civil War, or World War II were the turning points in our history." Surprisingly, I found his thoughts on the subject very interesting. For me, a person who has a hard time coming to grips with the war in Iraq, his brief synopsis of how and why America became a military and moral leader became more clear. This country has been forged with the sweat and blood of it's military, its citizens and its leaders. Lula - I saw you took off your political comments. With your disclaimer on there, your comments were just fine if you wanted to put them back on. FYI. I decided they weren't necessary. This is a book review blog not a political one, and although I felt at first they were closely enough related to the topic at hand, I don't want to rile people's feathers. That goes against the whole point of the book. No worries. I just saw you'd taken them off and didn't want you to think your opinion was unwelcome, especially as it was related to the post. I only worry about what people say if they start insulting or bashing other people's beliefs and such, and you didn't do that, I wanted you to know. maybe i'm missing something, but why did Stephen Ambrose use the word "an" (instead of "a") in front of the word Historian in the title? 'ave we gone Cockney for some reason? 'ow 'istrionic! That's so funny because I was wondering that too. It's really starting to bug me, although your comment made me chuckle. Every time I see it I do a double take. Is H sometimes an exception to that rule? An Harry Potter, an hair piece, an history. No, what the crap, who the hell knows? The whole book had a rushed sort of feel because he was ill, so maybe the editing process was rushed too. The a/an rule is not a spelling based rule, but a sound based rule - the rule is basically that you use an if there is no stopping consonant sound (after all, you say 'an hour', and you say 'a unicorn'). Because it's based on sound, there are certain situations in which a or an will depend on the dialect. A/An is basically an ease of use kind of difference - depending on how hard you lean on a non-accented H, it may be more natural to say 'an historical occaision' (the n gives you a consonant to slide from word to word across), or 'a historical occaision' (you use the h to slide with). Myself, I tend to use 'a' if the accent is on the first syllable - since that puts more emphasis on the first h ('a heavy-set gentleman'). But I tend to use an, if the emphasis is on the second syllable, and it is a soft instead of a hard h ('an Hibernian Air', but then 'a hirsute upper lip' because the h in hirsute is much harder). So yes, H is kind of mushy ground, because it's such a light consonant.